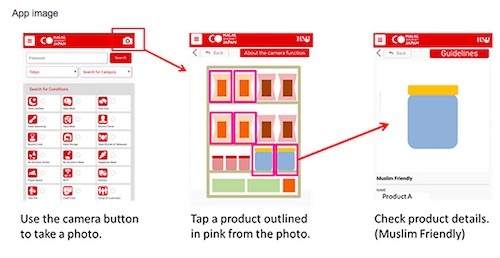 TOKYO, Sep, 26 2018 - (JCN Newswire) - NTT DOCOMO, INC. has developed a handy smartphone app that will enable foreigners in Japan who have special restrictions to determine the detailed contents of Japanese-labeled food products simply by photographing the products with their smartphones. The app will leverage an image-recognition engine built with NTT's corevo AI technology to identify the product and then provide the user with a detailed list of its ingredients in English. The commercial launch date has not been decided yet. Until now, foreigners with special dietary restrictions, such as Muslims and vegetarians, have had to use translation apps to check product labels written in Japanese and then attempt to determine if the ingredients are acceptable. Due the difficulty and inconvenience of this procedure, some foreigners visiting Japan have felt it necessary to go to the trouble of bringing products from their own countries. With DOCOMO's new app, however, these people will be able to identify the ingredients and appropriateness of products available in Japan easily and quickly, without having to touch the products. The app will be especially timely as the number of inbound visitors to Japan continues to climb and unfamiliar Japanese products attract increasing attention. Visitors with special restrictions are expected to welcome the app's introduction enthusiastically. Prior to the app's introduction, NTT DOCOMO will provide the image-recognition and related system technologies for use in HALAL GOURMET JAPAN, a popular restaurant-discovery app for Muslims in Japan, which is managed by FOOD DIVERSITY Inc., from September 26 to December 31.